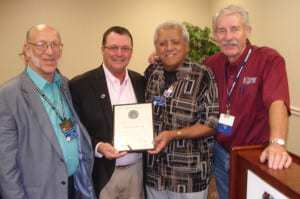 Will-Cook Knights of Harmony Musical Director Bill Kerschbaum, Illinois District President Jeff Bowyer, Will-Cook President Lou Gonzalez, and Immediate Past President Earl Meseth at the presentation of the chapter’s charter at the district’s Fall Convention. [T]he newest chapter of the Illinois District is now official. District President Jeff Bowyer presented officers of the new Will-Cook chapter, the Knights of Harmony, with their charter at the fall convention in Bloomington. Chapter President Lou Gonzalez, Immediate Past President Earl Meseth, and Musical Director Bill Kerschbaum represented the chapter at the ceremony, which is a merger of the Joliet and South Cook chapters. Joliet and South Cook were both formed in the 1950s and have long traditions in the Illinois District. Members have been part of four district quartet champions: Sundowners (1965), Friends (1980), Chicago Chord of Trade (1985), and Chordiac Arrest (1987). All four quartets made their mark in International competition. The Sundowners medaled six times, including second-place finishes in 1970 and 1971; Friends were three-time semi-finalists between 1980 and ’82; Chicago Chord of Trade was a four-time finalist, with fifth and third-place finishes in 1987 and ’88; and Chordiac Arrest, another four-time finalist with a pair of fifth-place medals in 1988 and ’89. 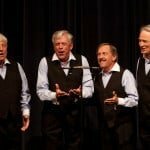 The new chorus is already continuing that tradition with recent performances before games of the Windy City Thunderbolts and at a breakfast honoring organizers of Honor Flight Chicago. The Will-Cook chapter meets Thursdays at 7:30PM, alternating between the First Congregational Church, 700 9th Street in Lockport, and Glory to God Evangelical Lutheran Church, 18401 66th Avenue in Tinley Park. 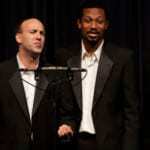 Men interested in singing with the Knights of Harmony should call (708) 614-8999 or (708) 570-1169.